In March 2002 we traveled to Havana, Cuba, with another University of Chicago alumni tour. I took my usual multitude of photos, some of which are shown here. Click on an image to see in full size. A winsome Cuban lass, who was pleased to let me take her picture ... for $1. 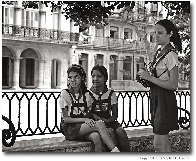 A young Cuban schoolgirl smiles while watching an anti-U.S. propaganda film. Vintage Autos A collection of photos of vintage automobiles seen near the Capitol building in Havana. A small sample of the hundreds of photos I took at the Tropicana Night Club. Wow! What exotica! What color! What a performance!